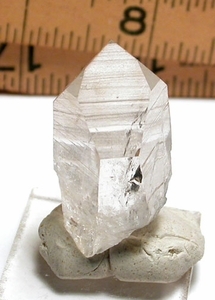 This gem smoky quartz crystal is a transmitter with record keepers and a hairline uncommon 7h face to the right of the main. Inasmuch as natural smoky quartz is quite rare to Arkansas, gem grade's a fortunate find for your collection. A frisson of veils, growth craters and a rainbow in its' base make it a choice stone for jewelry as well. 3/4x 1-1/2" from Garland County to you.